WHAT IS HeatBloc Attic Heat Barrier? HeatBloc is an aluminum colored, water-based, low emissivity (low-e) coating. When applied to building materials such as plywood, OSB or plasterboard, HeatBloc lowers their surface emissivity up to 0.19, thereby blocking up to 81% of the radiant heat trying to enter the home. It is classified by ASTM as an Interior Radiation Control Coating (IRCC). HOW DOES HeatBloc Attic Heat Barrier WORK? HeatBloc radiant heat barrier works by changing the emissivity of the surface where it is applied. Building products such as wood, brick, and plasterboard have high emissivities (0.7-0.95). When heated, they radiate most of their heat to cooler surfaces by allowing the heat to penetrate the roof into the attic and from the attic into the house. HeatBloc lowers their surface emissivity to under 0.23, lessening their ability to radiate heat and therefore letting less heat penetrate the roof into the attic. Heat penetrates buildings in three ways: conduction, convection and radiation. Radiation is the transfer of heat by electromagnetic waves known as thermal radiation. Thermal radiation is a form of invisible light that travels through the air from a warm to a cool surface. Warm surfaces, such as roof decks warmed by the sun, will radiate or emit their heat to cooler interior building surfaces. Radiant heat barriers address heat flows by radiation. A radiant heat barrier is a low-e surface placed in the path of thermal radiation that blocks heat transfer. Emissivity is the ability of a surface to radiate or emit energy in the form of long wave electromagnetic radiation. It is represented by a value from 0 to 1. The closer the value is to 1, the less effective the surface is at impeding radiant heat transfer. Wood has an emissivity of 0.90. Thus, when wood is heated above the temperature of surrounding surfaces, it will tend to transfer 90% of its heat energy by radiation. HeatBloc, when applied to most non-porous surfaces, will decrease the surface emissivity up to 0.19, allowing only 19% of the heat energy to be transferred by radiation. WHAT IS THE ROLE OF AIRSPACE WHEN USING HeatBloc? To function effectively, a radiant heat barrier must face an airspace of 1″ or greater. A radiant heat barrier will not function if sandwiched between two solid surfaces. HeatBloc, when installed on the underside of roof decking, normally faces downward into the attic. If insulation is installed in the cavity formed by the roof trusses and roof decking (as in a cathedral ceiling), at least 1″ should be allowed between the top of the insulation and the HeatBloc surface. DOES HeatBloc DEGRADE OVER TIME? WHAT IS THE PRODUCT LIFESPAN? HeatBloc does not lose its effectiveness over time like some products. Foils can tear and require the staples to penetrate the barrier. 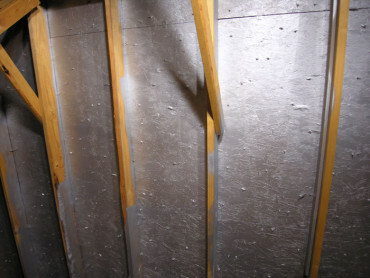 Foil chips can accumulate dust, which diminishes their effectiveness. HeatBloc will last as long as the surface area it is applied to is not damaged or disturbed and nothing is coming in contact with the product. IS HeatBloc PERMEABLE TO WATER? Yes! HeatBloc allows water vapor to permeate, and does not trap water vapor within roof decks or sidewalls. This is vitally important in attic conditions. DO RADIANT HEAT BARRIERS LOWER HEATING COSTS? While they are most effective at lowering cooling costs, studies performed by the University of Kansas have showed a 15% reduction in heat loss through the attic when radiant barriers are used. WHAT IS THE COVERAGE RATE FOR HeatBloc? Recommended coverage for HeatBloc is 325 – 500 square feet per gallon depending on the porosity of the substrate. WHAT IS THE RECOMMENDED APPLICATION METHOD FOR HeatBloc? For best results, spray application using a spray pump size ¾ GPM or greater, 2,000 psi and tip size of 0.019” to 0.021”. The product can be rolled with a 3/8” synthetic nap roller, however, roofing nails penetrating the surface can make brushing or rolling difficult. CAN HeatBloc BE USED ON SIDEWALLS? Yes, but HeatBloc is normally more effective when used under roofs. Roof surfaces are generally much hotter than sidewalls. Up to 80% of the summer heat gain is from above. Low e surfaces become more effective in controlling radiant heat transfer as the temperature of the radiant heat source increases. However, in tropical climates where no insulation is used in sidewalls, HeatBloc can substantially help increase interior comfort levels. CAN HeatBloc BE USED IN VENT-SKIN CONSTRUCTION? Yes. In vent-skin roofs HeatBloc should be applied on the underside of the outer roof skin facing down into the vent channel. On vent-skin sidewalls HeatBloc should be applied on the inside of the outer skin facing into the vent channel. CAN HeatBloc BE USED WITH RADIANT HEATING SYSTEMS? Yes. It is an effective heat reflector when used behind wood stoves or on walls adjacent to ceiling mounted radiant heaters in commercial applications. Absolutely! Radiant heat barriers only control radiant heat loads. Good attic ventilation helps control convection loads. Together they raise the comfort levels and lower cooling costs. Venting to allow 2.5 air changes per hour should be specified as a minimum. DO RADIANT HEAT BARRIERS HAVE AN “R” VALUE? No. R-values apply only to solid insulation or to insulating systems that control heat flows other than radiation. In independent testing of the product at the University of Kansas, the R-value of the insulation, after applying HeatBloc to the roof deck, increased by 87% to 98%.